Tee off a successful marketing campaign with the help of this great gift! 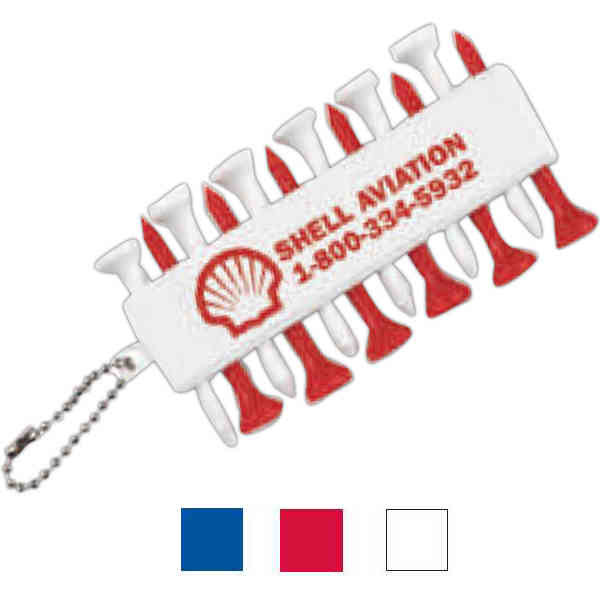 This professional golf tee set features 12 plastic tees and 3 ball markers. The ball chain attaches to a golf bag making it easy to take along with you from hole to hole. This set is refillable with standard tees. Available in bold colors; add your logo to promote business! It's an excellent choice for charity matches, tournaments, company golf outings and more! Size: 2 " x 4 "
Price Includes:a one color/position imprint. Imprint Size:2 1/2" x 1/2"
Ship Weight:100 pcs. / 8 lbs.